From discussing ISIS to Development Goals, to Papal visits, to migration flows, various aspects of the broad phenomenon that we call ‘religion’ have become a regular feature of current affairs. However, the extent to and the logic through which religion is or can be associated with conflict and with peace remains a highly disputed issue. A new British Academy publication commissioned by DFID, that James Mayall and I have written had two aims in mind: to critically engage with the notion of religion in its multifarious facets; and to review the available literature and evidence on the roles of religion in conflict and in peacebuilding. The idea is that on the basis of this evidence and lessons learnt, more discernment can be brought into various policy domains, institutions, and processes where religion’s salience has grown at times against Western secular assumptions. The research we conducted covered a vast and emerging literature in the social sciences and humanities as well as increasing interest and reports coming from policy circles. The main message to draw is that religion is indeed relevant to both conflict and peacebuilding and that therefore the policy and diplomatic community should pay attention to this. Yet simultaneously, some caution is in order because the relevance of religion can only be appreciated by disentangling with nuance the web of actors, ideas, discourses and processes involved. Incorporating attention to faith and faith-based actors in approaches to conflict is therefore not a simple tick-boxing exercise; it would be naïve to see it as a quick panacea to conflicts that really ought to be addressed by the international community through collective responsible efforts that are likely to last several years. Seeking to isolate something called ‘religion’ in the midst of complex dynamics of violence and of peacemaking is unlikely to yield useful outcomes, because of the lack of a unitary understanding of religion’s essence and of its effects, because of the secularist leanings in some public institutions and countries, and because of the multiple ways in which religion and secularism can be deployed for different purposes. The evidence we reviewed shows that religion can often exacerbate conflicts or ease them when people in leadership positions (both political and religious) decide to resort to religious values, symbols, and language for a particular purpose. This does not mean that the relevance of religion in the contemporary world has all to do with people in hegemonic positions. Non-governmental organisations and independent thinkers and activists have often dared to speak against and challenge the status quo, both with arms and with peaceful means. Special attention ought to be spent in the face of the growing threats of the so-called faith-based terrorism, and of insurgent groups claiming to act in the name of religion. Many of the conflicts involving violent groups asserting a religious identity ought to be read against the background of weak institutions, the breakdown of social relations, and failed states, which in turn have allowed the spreading of structural inequalities, corruption, a culture of violence, illegal trafficking and easy access to weapons. Disempowering leaders and groups that manipulate religion through violence in order to maintain their position and maximise their interests is not sufficient to stop the circle of violence and can always lead to the risk of demonising a religious community. So resolving conflicts involving a religious component would need to go hand in hand with a reconstructing and rebalancing approach that addresses structural needs and allows the positive potential of religious discourse and values to re-emerge so that human relations can be rebuilt. 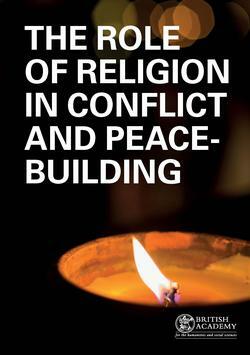 You can download the British Academy report Religion in Conflict and Peace Building here. Dr Sara Silvestri specialises in religion and politics and is based between City University London and Cambridge University. She is one of the authors of the British Academy report Religion in Conflict and Peace Building.